Timmy Brister offers a quote from the pen of John Newton that speaks heavy hope to believers suffering loss and experiencing pain. The above photo pictures my brother and I walking down Lakeshore Road five days after Hurricane Katrina. May God, our mighty fortress, continue to remind us of Christ our supreme treasure and flood us with his sustaining grace. 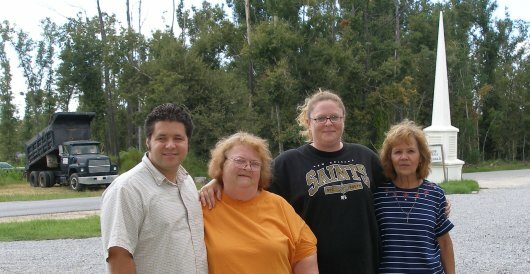 Mrs. Williams (second from left) lost everything she owned in the storm, yet she still thanks God for his persistent love, abiding presence, never-failing faithfulness, and even the “terrible storm.” She frequents our distribution center where one of her daughters serves as a full-time volunteer. She wrote the following letter and I wanted to share it with you. To the churches and volunteers who have come down here to help us with food, clothes, blankets, towels, all the things we so needed and had taken for granted, I want to express my heart-felt love and appreciation. You have done so much, and helped for so long, you never gave up on us. There can never be enough said about all of you, about how you have taken care of our needs, down to paper and pens, books, crayons and toys for the children. We never had any idea that it would take so long for us to recover, and yet, you come! I’m beginning to think we aren’t recovering, but we are starting over. Without each and every one of you, I don’t want to even think about what it would be like here. I am a 66-year-young grandmother of eleven grandchildren; I have five wonderful daughters that I thank God for. I am very blessed. When I left here to escape the â€œstormâ€, we all thought we’d be home in a couple of days; we took the bare necessities, just a few clothes, and those not the best, some blankets and pillows. I took two changes of clothes, my comforter off my bed and one of my Bibles. Everything I owned had been given to me by my loved ones over the years, nothing fancy, nothing expensive, but now and then I remember a special keepsake a loved one now passed-over had given me or a picture of a special day or smiling children looking down on me from pictures on the wall. These special treasures we all have, just look around, you’ll see what I mean, treasures that bring back sweet memories. It took us a while to come back, but I wanted to come home. My grandparents lived here, my parents, aunts, uncles, my family. This is our home. It is hard to see everything destroyed. What I do is concentrate on every good and wonderful thing that is being built back. At first, just the clean-up was a wonderful thing to see, then to see the homes being built back, one at a time, our home town. Thank you all! One of my daughters and I go to the beach three or four times a week. We want to thank God for saving our souls, our lives, our loved ones. We walk, we sometimes take nets and catch a few crabs to boil and eat later. Mostly we just sit on the sand and watch the waves roll in. It’s strange how the same waters can soothe us that once destroyed our towns with such fury and we can still say thank you God, for loving us so much to give us such beauty to enjoy. And thank you Lord for sending your sons and daughters here to lift us upâ€”to help us to become strong. So much to be thankful for! God tears down, God destroys, God restores and saves our souls. If you asked us, who know the Lord, would we want this storm never to have come, we would have to say this storm destroyed our world, the lives we were accustomed to, it knocked us down, and we couldn’t get up, not without helpâ€”you are that helpâ€”you are God’s hands, His strong arms, you are God’s love to us. I thank God for â€œKatrinaâ€; I see God’s love in all of this. Yes, thank God for the terrible stormâ€”for God is in the midst of the storm, and He has never left us, or forsaken us, even now. My love for God is even greater now, for I have seen the truth of His Word down here in the trenches. His love is there, He never takes His love away. Things come, things go, but God is faithful through it all. We pray and know God is blessing every one of you. Thank you and God Bless you and your loved ones, wherever they are. The Sacco family of New England spent their summer vacation working with us in Lakeshore. Katherine wrote the following report for their local newspaper. This summer, my mother decided that as a family we would make our vacation a “learning experience” and do volunteer work, something we had never done as a family before. 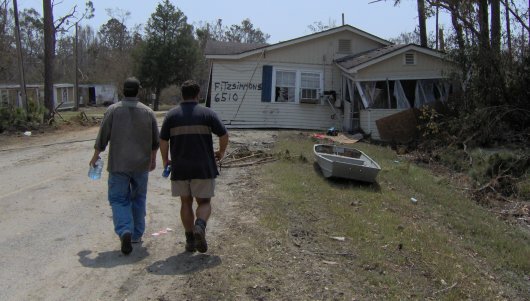 We headed where Hurricane Katrina had devastated parts of the United States. Driving along the Mississippi coast just about 50 miles east of New Orleans, we found the Lakeshore Baptist Church. Lakeshore is an unincorporated community in Mississippi’s southernmost county. It is on a bayou of the Mississippi Sound along a stretch of coast that was the final place hit by Katrina with its 150-mine-an-hour winds. The area endured 42 feet of flooding and property for miles was devastated. The commercialism and economic prosperity that we consider normal in our hometowns is desperately lacking here. It was only after driving along the coastline of empty beaches for half an hour that we found a single restaurant for dinner, incidentally celebrating its grand opening. On a side street, we found a bank, but all that was left of it was the vault on an empty lot of rubble. It was mind-boggling that two years had passed, and so little rebuilding had been accomplished. The buildings of Lakeshore Baptist had been destroyed, although recovery crews found the church steeple intact in the woods across the street; it is now displayed in the front of the property. Quonset huts house a distribution center, and quarters for the volunteers. The main Quonset hut has bathrooms and storage, along with a large room that is cleared of volunteers’ sleeping bags twice a week for services to be held. The kitchen is on an adjoining property that the church bought after the hurricane. The kitchen is built on top of the concrete foundation that remains from the house, with only screens as walls for most of the building. In the back of the buildings is a mound of dirt, obviously man-made; a member of the church explained that the debris from the local school has been buried there. Paths of pallets lead from building to building, and we were warned not to venture into the grass because of black widow spiders. My family joined more than 150 volunteers who had come, mainly with church groups, from all over the country to donate a week of service. Jobs range from clearing debris from the yards of community members to helping to rebuild houses to working in the kitchen making meals for the volunteers. Miss Bea, who is in charge of the distribution center, lives in minimal conditions herself with no air conditioning in the Mississippi heat this New Englander found unbearable. Her own property is still littered with rubble, as it had been since she returned after Katrina. I questioned whether my family would have had the strength to return if this had been our home. One 90-year-old woman, dressed in straw hat, slacks and a scarf, arrived at the center with her grown daughter. She proudly explained that she had found the scarf, emblazoned with the slogan the initials that stand for “What Would Jesus Do” or “Walk with Jesus Daily” and clearly the key piece to her outfit, right in the clothes section of the distribution. It was time for the Sacco family to show its worth. The distribution center houses food stored in sheds. One of the shed floors had collapsed, so the first project for the Sacco work crew was to shift cartons upon cartons of carrots, macaroni o’s, and green beans to take the weight off the caved -n floor. The ladies running the distribution center then enlisted the help of my family to make a new floor. With the project led by my dad, whom I had never seen so much as hang up a frame on the wall, and a leader from another group, with a similar level of experience, I must admit I was surprised when an hour or two later, the shed had a remodeled floor. It wasn’t the work of an experienced carpenter, but any help at all was welcomed and appreciated. My father, brother and I joined other volunteers in helping to repair a house. Sanding the ceiling gave us gray hair and sawdust in our eyes, but it was rewarding to know that we were doing this for someone else. I felt privileged to be entrusted with helping someone to build a future. It seemed as though the residents of Lakeshore had learned to put their faith in God that they would be provided for, and tried to look beyond their circumstances to find hope. I left Lakeshore with a respect for residents who had returned, an appreciation for my own fortune, and a prayer for all those who I had met. Thank you so much Katherine, for you and your family and the generosity that caring people like you continue to pour into our community. We praise God for folks like the Stepping Stone Foundation of PA for their continuing aid and support. Last week this group made their 14th trip to the region and brought donated items including food for the distribution center and bicycles. they also worked on several of our ongoing building projects. I’m looking forward to being in Alabama this coming week, September 16-17. Lord willing I will preach at Decatur Baptist Church on Sunday morning, East Highland Baptist in Hartselle AL on Sunday evening, and speaking before the Morgan Baptist Association of pastors on Monday. I pray that God would glorify himself through the proclamation of his word and and the report of what He continues to do through the relief recovery and rebuilding efforts in Lakeshore. Last week Cindy Swanson of WQFL-FM in Rockford, IL interviewed me regarding the second anniversary of the storm. You can download and listen to the full 15-minute uncut interview (DonElbourneInterview.mp3). I think she said it aired yesterday, on her weekend show. Thanks Cindy!